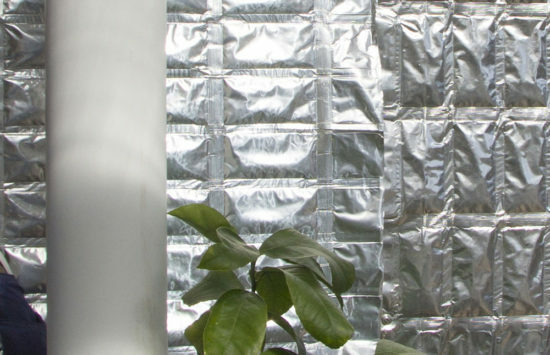 An innovative heat storage material, Phase Change evens out temperature swings in your greenhouse, providing passive climate control without any operational cost. Phase Change Material (PCM) passively absorbs and releases heat in the greenhouse through the energy transfer of phase changes, going from solid to liquid. During the day, as the material melts, it absorbs huge amounts of energy called latent heat. When greenhouse cools at night, the PCM ‘freezes’ and releases this heat. This basic energy transfer of phase changes is responsible for many technologies and materials, such as the refrigeration cycle, and heat pumps. 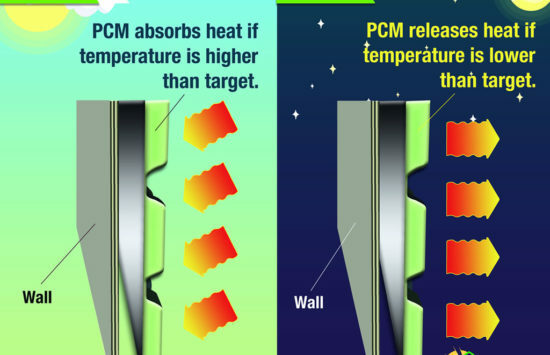 PCM simply harness this reaction to passively store heat in the greenhouses. By passively storing heat in the greenhouse, Phase Change Material acts like a battery, just like water barrels (also called thermal mass). However, due to the latent heat transfer of phase changes, PCM has about 5x the storage capacity as the same volume of water. It can be built into a new wall or added onto an existing wall, passively evening out temperature swings without sacrificing growing room. Ceres’ PCM is $3.50 per sq. ft. and has an energy capacity (measure of thermal storage) of 100 Btu / sq. ft. We work with you to specify how much PCM your greenhouse needs. Ceres Phase Change Material is $3.50 per sq. ft.. Please contact us for a personalized quote and / or energy analysis of your greenhouse. What is PCM made out of? There are a variety of substrates for PCM. Our standard PCM product is a salt-hydrate, which has an energy capacity of 100 Btu / sq. ft. (We help you calculate the energy capacity for your greenhouse, and determine how much PCM you need). What temperature will PCM keep my greenhouse? Like other types of passive thermal mass (e.g. water or concrete), PCM can’t guarantee a set temperature for your greenhouse. It helps passively regulate temperatures for year-round growing. The material is selected to change phases as a given set temperature. We work with you to select the right product and quantity you need to grow what you want, when you want to. This is perhaps the best part about Phase Change Material… it is easily installed in, or on top of the wall. PCM panels are sized to fit a typical stud bay, so they can be easily installed in any of our year-round greenhouses (either wood or metal framed). PCM is easily installed by most homeowners using a staple gun. For commercial greenhouses, we provide consulting and / or installation services. Where is PCM located in the greenhouse? We typically install PCM on the north wall of the greenhouse. There is it easily integrated into an insulated wall, allowing for a large surface area.